Hoosier Beer Geek: A Beer Blog for Indiana, from Indianapolis: Before Canvitational, get to know Brewery Vivant! Actually no music is allowed in the brewery at all. By keeping it quiet our brewers get to know all the sounds associated with our process; pumps, boiler, grain auger, canning line etc. We find we have been able to troubleshoot quicker, and are better at our jobs. 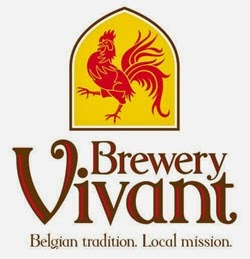 Brewery Vivant beer is inspired by the small farm breweries of Southern Belgium and Northern France. The enthusiasm and artistic approach to beer those brewers exhibit, are values we tap into when brewing here in the States. The beer styles from these areas allow for a wide range of interpretation that is a mix of old traditions, brewing science, artistic interpretation of style, and an adventurous spirit to try new things. The mood of the brewer on any given day can lead to a new recipe or twist on an old favorite. This upholds that artistic quality we look for in our craft beer. The brewer matters-- making beer is a hands-on process. It is not always perfect, but that is what makes it art. It is made with heart and feeling. And to us that is why it is special. Hmmm four brewers, four beards also some ridiculous mustaches around here. I always have some classic Belgian beers in my fridge; Duvel, Orval, Leffe, La Chouffe. Also really enjoy beers from Solemn Oath in Chicago area, anything from the Bruery in California. Really mad at those guys for coming up with "Tart of Darkness". It is a wonderful beer so can't complain too much. I usually drink our Farm Hand. Just some nice nuances in that beer. I taste different things everytime I drink it. Depends on my mood, what I am eating, etc. Lately though I have been downing our Tree Bucket Belgian style DIPA. At 9.7% it is not a good idea to make that a shift beer.